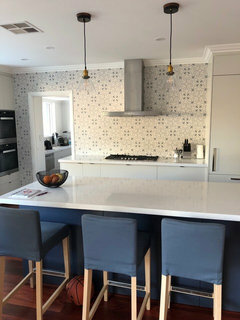 White Stone Benchtops to match cool white walls. Suggestions please! We are trying to pick a white stone/composite bench top that flows with our Lexicon 1/4 walls. We don’t want marble look but don’t mind veining. Our kitchen I was hoping was going to be white top with colour matched painted drawers underneath with charcoal/blue timber veined overheads. (First image, not quite true to colour in photo). I am having a really hard time finding tops that don’t clash with the walls. They are too warm compared to the walls. Have attached photo of the kitchen. There will be an island with drawers on the inside between it and window. I can’t change the colour of the walls as it all flows together into an open room. I’d have to repaint the house!! In hindsight I should have chosen the top first then the wall colour! Any advice greatly appreciated. Third and fourth photo are what I’m trying to achieve. Photos are out of order. Pinterest ones are what I’m trying to achieve. Photo of the kitchen as it is now and the sample chip for overheads. Hi. Just throwing this out there even though you said you are looking for a white stone. 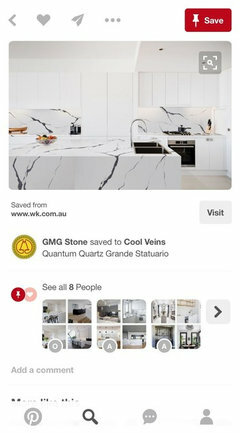 Would you possibly consider a light greyish colour like Bianco Drift (Caesarstone)? It's cool toned with veining (looks a bit granite-like). I chose this a few years ago and still love it. Best to actually see a sample as it looks cooler in reality than on screen or in brochures. Goes well with charcoals, greys, coolish or neutral whites, wood. 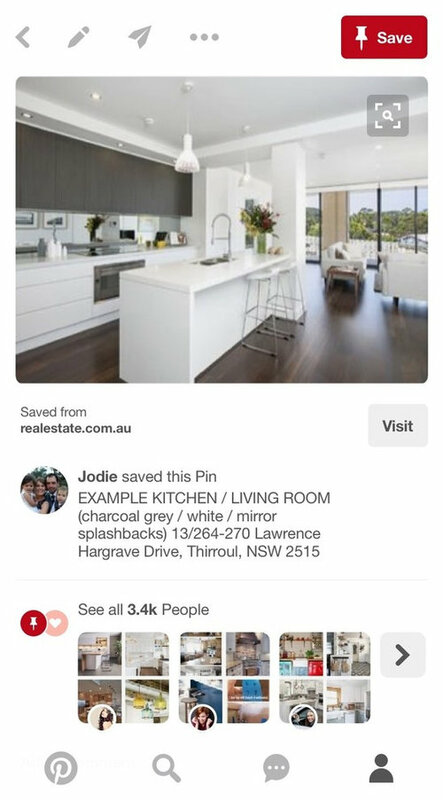 It might be easier to match a light grey benchtop (rather than a white one) to your white walls and white cabinetry. Good luck. Hi Adriana, You can have whatever you want and works with your style. If you go with tiles then invest the extra money in epoxy grout that will make cleaning a great deal easier - regardless of what colour/style you go for. Dark grout with white tiles is quite modern and makes cleaning grout a little easier - personally, I don't favour it but that's just personal taste. I would check the ease of cleaning on any matt tile. To bring in warmth to your kitchen (as black and white can be a bit stark sometimes) look at bringing some colour in - even metallics in silver, bronze or copper or even opalescent tiles can be gorgeous and can also help bounce light in a subtle way back into your room while giving you a luxury look with depth and interest. Go to your tile supplier and ask for samples so that you can take them home and put them in the space and get a sense of how they'll work - sometimes the way they look away from the tile shop is completely different to how they look in the shop. Good luck! Which white works with Frosty Carrina? Hi I'm having a very similar dilemma. We have an older home and have just installed a new kitchen. 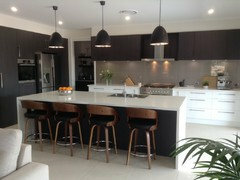 The cabinets are all Dulux Lexicon quarter with Calacatta Nuvo benchtops. We are planning on doing our splashback with a subway tile and have chosen a soft dove grey (for more warmth) with white grout laid in traditional brick pattern. Our walls are Hogsbristle half and our floors are a golden hardwood. I've noticed with the cabinets now installed is that the kitchen looks just so stark now and I'm just not 100% happy with it. The bulkhead is as yet unpainted and no appliances are in yet. We have 3 pendant lights over the island with a warm led globe, and another larger downlight in the centre, between the island and rear cabinets with a cooler globe. If I change the cooler globe to a warmer globe will this make the cabinets appear less stark? We don't get a lot of natural light in the space hence the Lexicon selected in consultation with our kitchen designer. 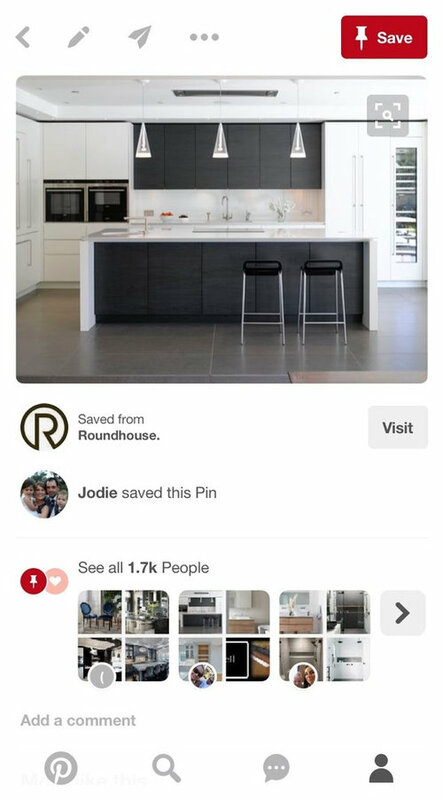 Hi Sofia, the latest trend is that all white kitchens are on the out, so breaking up the colour scheme is and introducing natural elements, which is now the trend, is bang on. Well done. A natural style includes natural materials and colours. The thing is what sort of natural. This comes back to your style. What is it? Natural rainforest feel, desert, beach? If you think of your home in this light, it helps you to choose the right direction through textures that you can then take throughout your home to streamline it and increase it's appeal. In decorating we also look for opportunities to add contrast, so I see nothing wrong with a dark bench but here's the other lesson! Uniting your colours is vital. 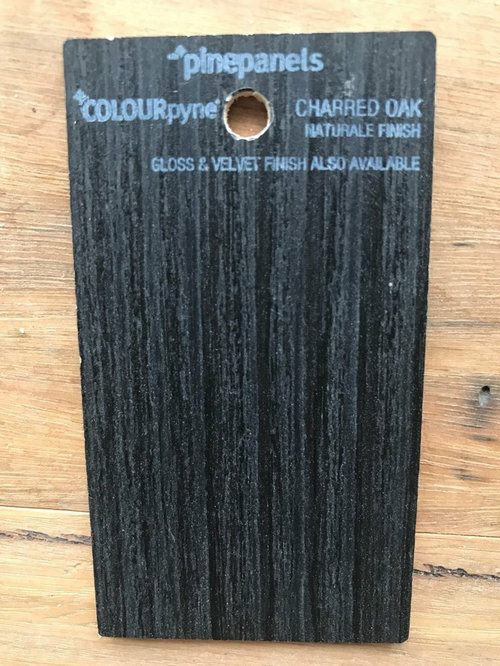 You have a timber look floor and a grey splashback - they are different. They need to be merged. 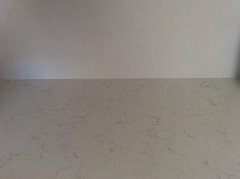 Merge them in your benchtop with a Ceasarstone (which is worth every penny you put into it for the resale of your home). 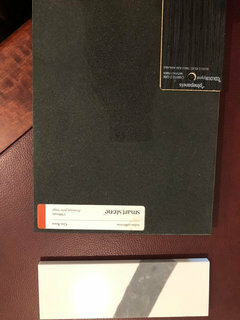 Something like this one: http://www.caesarstone.com.au/colour/6270-atlantic-salt ...Which isn't too dark, has a gorgeous contrasting texture and yet the timber and spalshback hues. Wallpapers are in big time and have been for a while and are not going out. Try picking out a major wall here and there and hanging a textured or a natural themed wallpaper ie leaves pattern, depending on the style, in a natural colour palette to match your floor. The whites, greys, blacks are neutrals - which go with anything. Compliment the colour scheme with Green which is a receding colour and will create the illusion of more space in a small space, and you'll have a natural style and theme. Lastly, again, depending on your style and theme, you'll need art to confirm exactly what these are. I am a customised artwork specialist. Your artwork again, will unite all your colours and create a focal point for the space... and so very much more. Have fun! Bench top to Match Lexicon White. Going to visit stonemason tomorrow so will take samples of overheads and drawer colour with us. Hopefully find something suitable. It will be really good to discuss it with the stonemason and see their samples. Definitely try to take some offcuts or samples home with you to place in your kitchen and live with for a while before deciding (if possible). My stonemason gave me a nice sized polished offcut to take home and it helped so much in the decision-making process. Don't give up on your dream just yet! Hi, we also used Lexicon 1/4 on our walls. This is my kitchen, laminex burnished wood, and caesar stone bench tops. Gin72 that is so very close to what we are trying to achieve!! Are your cupboards Lexicon 1/4 also? What top did you decide on? 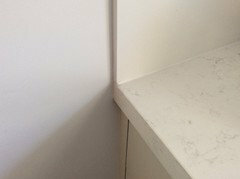 Our walls are Lexicon half and we used VedaStone/Techistone in Noble Supreme white as it was a cleaner/cooler white than other brands. They also have Noble Areti Bianco, both have a grey vein. Jodes, the lower cupboards are polar white, Laminex. The caesar stone is Osprey. We used Lexicon on all the walls, really nice colour that looks great against the dark cabinetry. For the island top, I think if the bevel joint is used in the "leg" pieces and the top piece, it will look really nice for a white top. Yes, that’s what we’re planning. Just need to find the right colour. Getting a quote on the Grande Statuario. I think it’s going to be significantly dearer than our first quote ☹️ The crispness of the White is perfect with great veining. 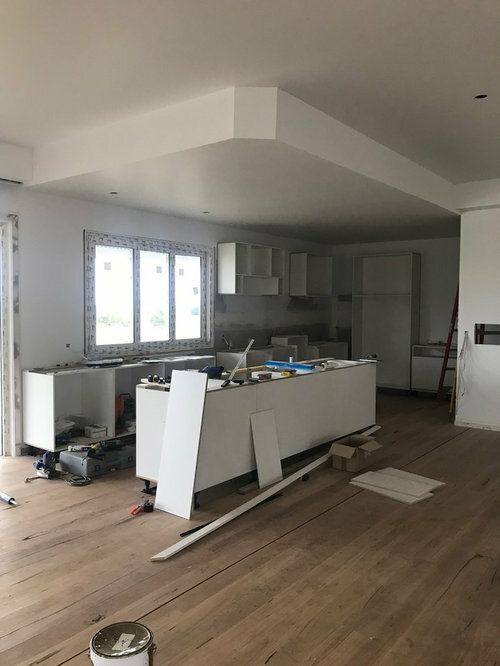 Second quote being done with main island in the Statuario and with Smartstone along benches under window and into pantry, in case the first is too dear. Took our Lexicon 1/4 and overhead samples with us. Really happy with the choices. I just hope the first quote isn’t too dear as I’d prefer all white but I’d be happy with the combination of both tops.